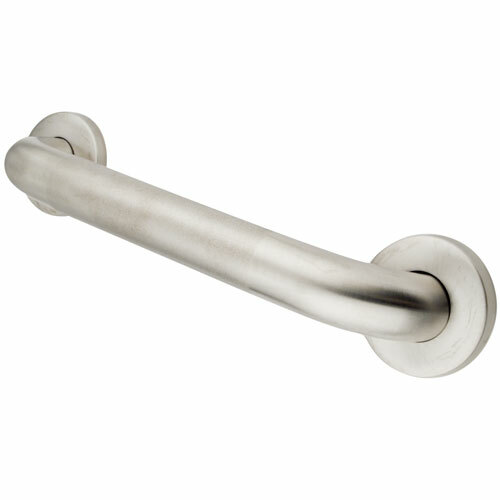 Kingston Brass Grab Bars - Satin Nickel 12-inch Commercial Grade Grab Bar GB1212CT: This 12-inch Commercial Grade Grab Bar is built to last. The highest quality standards are used to precision manufacturer a top of the line product. Important features of this BRAND NEW Fixture: Complete Item! Everything necessary for installation is included. Matching Accessories Available - Easy to Install - Installation instructions included - 12-inch Commercial Grade Grab Bar - Fabricated from solid brass material for durability and reliability, 1-1/2-inch gripping surface on grab bar, Easy to install, 1-1/2-inch (38mm) wall clearance meets ADA standard, Mounting hardware included (2-inchx#10 Philips Head Screw. Total 6pcs), 12-inch overall length, 1-1/2-inch outer diameter, One Year Limited Warranty to the original consumer to be free from defects in material and finish. - Mounting hardware included - 12-inch length - 1-1/2-inch OD - Constructed from solid brass for durability and reliability - Satin Nickel premier finish designed to resist fading and tarnishing. This fixture is manufactured by Kingston Brass and is part of their Made To Match collection.